Our Kubota KX 41-3v is able to reduce its track width from 1300mm down to 900mm making it available for those narrow access areas, so before you give up on the idea of a mini digger for the job give Andy a call on 01539 552458 or 07836 782707 or e-mail us to see if we have a machine that will work for you. 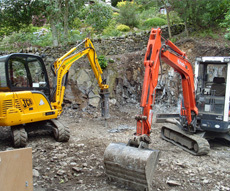 Plant for domestic use supplied with CPCS trained operators. 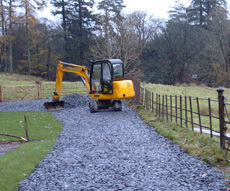 At S & A Hodgson Plant Ltd, we not only deal with the large groundworks, roads and forestry work, we also deal with gardens of any size, we can even offer the services of design and landscape for your garden or grounds, complete driveways, or even removing a stump in the garden or a hedge that is no longer required. A mini digger saves a large amount of time and labour preparing groundwork for patios, paths, gravel drives, block paving, new beds, drainage, soak-a-ways, ground clearance, ditch digging and building footings. Give Andy a call and see how we can help with your landscaping preparation on 01539 552458 or 07836 782707 Or just email us for more information.